Laughlin, Nevada - The center of the tri-state area is home to great experiences & accommodations.Situated on the shores of the Colorado River, Laughlin offers many activities for the whole family. 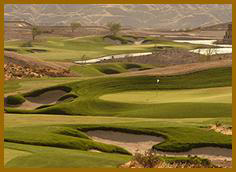 For the golf enthusiasts visiting the area, Laughlin Ranch Golf Club offers a true test of golf. Located just 3 miles from the Laughlin Casinos, Laughlin Ranch was recently voted 11th & 13th best in the state by Golf Digest & Golfweek. With dramatic elevation changes, accommodating fairways, & generous greens, Laughlin Ranch is your best bet. 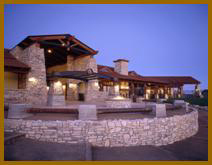 Laughlin Ranch Golf Club also offers an award winning clubhouse which includes a spectacular Grill Restaurant & world class Spa. For those non-golfers, the Laughlin area offers a wide variety of activities. Take in the views of some of the beautiful surrounding mountain ranges, which offer a wide variety of hiking trails & wildlife watching. Enjoy boating, fishing or a refreshing dip in the brisk water of the crystal clear Colorado River. 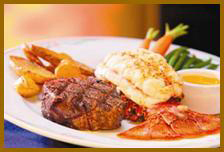 Laughlin also offers guests great hotel & casino accommodations as well. The Colorado Belle Casino Resort is a replica of a 19th century paddlewheel riverboat set on the scenic west bank of the beautiful Colorado River, offering visitors exciting gaming action on the industry's hottest new machines as well as plenty of live table action. After a great day of golf, relax and enjoy legendary dining in one of six excellent restaurants, including Mangia! 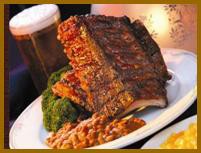 Italian Eatery, voted Best Food in Laughlin, Mark Twain's award-winning barbecue restaurant, and Pints Brewery & Sports Bar, Laughlin's only microbrewery, featuring spectacular beer and menu. Set on the west bank of the sparkling Colorado River, the Edgewater Casino Resort offers the perfect accommodations for a relaxing golf getaway. During your stay, enjoy exciting live table action and the newest machines in the gaming industry as well as one of Laughlin's largest race and sports books in the Edgewater's casino. The Edgewater has three excellent restaurants including the Hickory Pit Steakhouse, the Grand Buffet, and Coco's Restaurant. Edgewater's showroom is home to red-hot entertainment, hosting Comedy on the Edge and Inferno Night Club Friday thru Sunday. 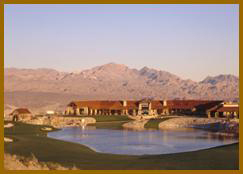 Click here for a pictorial review of Laughlin Ranch Golf Club.